In 1990 when it all started, a thorough analysis of available microlights was made. In particular, the team looked at performance parameters that are important in formation flying: manoeuvrability, rate of climb and descent, engine power and minimum/maximum airspeed. Secondly, the "looks" of the aircraft was also taken into account. Eventually, the British made "Pegasus Quasar" were chosen. 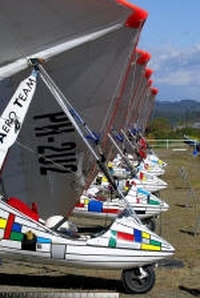 These microlights are controlled by so-called "weight shift".A three bladed propeller is powered by a 65 HP, 500 cc, two-stroke Rotax engine with double electronic ignition. The aircraft can carry two passengers and take off and land on its own. The cruising speed is 80 kmh and the maximum speed is 120 kmh. To protect the environment, the Dutch government imposes tight restrictions on the noise emission of microlights. At an altitude of 150 metres, the Quasar only produces 58 dB and therefore keeps to within these limits. With 42 litres of fuel, 350 km can be flown. The wing has a surface area of 14 m2 and is equipped with a "trim" to enable easy adjustment of the flying speed. The maximum take-off weight is 450 kg. 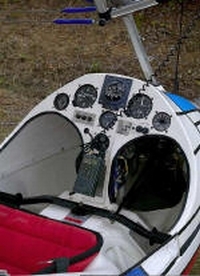 The cockpit holds the necessary equipment, such as: compass, height- and speed indicator and a radio. Besides that, a GPS (Global Positioning System) and a transponder are used on longer flights abroad. In the early seventies, Microlight Aircraft (MLA) was introduced in The Netherlands. On a very small scale, locations were approved for Microlight flying. In the second half of the eighties, Microlight flying became more popular and was regarded as an integral part of the small aviation sector. More rules and procedures were defined for airfields and flying schools. 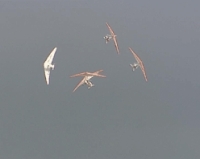 As a result of the growing popularity of Microlight flying, the demand for demonstrations during air shows and local events grew also. This led to the formation of a national demonstration team to contribute, in an original and disciplined manner, to the promotion of aviation in general, and Microlight flying in particular.